Originally completed in 1974, then rebuilt in 1997, the Getty Villa is a faithful replica of a Roman villa that was buried by the eruption of Mount Vesuvius in the year 79. Perched on a hill overlooking the Pacific Ocean, the Villa was built to house the expanding art collection of oil tycoon J Paul Getty, and now has one of the world's finest displays of ancient Greek and Roman artefacts, comprising over 44,000 pieces. The best known item is Victorious Youth, one of the only surviving life-size Greek bronzes in existence. 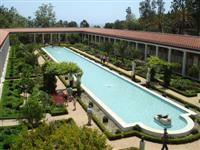 The Getty Villa also has over 20,000 books in its library, and collections of jewellery and coins. The free guided tours of both the exhibits and the gardens are highly recommended. Address: 17985 Pacific Coast Highway in Pacific Palisades, California, one mile (1.6km) north of Sunset Boulevard and approximately 25 miles (37km) west of downtown LA. Transport: Metro Bus 534 stops at Coastline Drive and Pacific Coast Highway directly across from the Getty Villa entrance. Admission: Free. An advance, timed ticket is required. Login to the website to book. Parking is $15 per car or motorcycle; $10 after 4pm.